and professional ship and boat building. Vectis has recently completed the structural design of two new high performance and weight critical advanced composite craft thereby consolidating our in-house structural design capability in both composites and metals. These craft follow the structural design of a novel 22m high speed craft and a next-generation 8m RIB both in advanced composite materials with infused and cored structural elements. This advanced composite design capability is available to other naval architects, boat designers and boat builders. We are pleased to report that Vectis Marine Design has moved to their own new offices. Vectis purchased the offices in January this year and has now moved in following four weeks of refurbishment. The office is located near Fareham in Hampshire, just off Junction 9 of the M27, with convenient access to the motorway routes and Southampton airport. Vectis Marine Design recently had the honour of a visit to our offices by HRH The Princess Royal. Princess Anne, The Princess Royal was visiting Fareham Innovation Centre as part of the celebrations for 100 years of flying from the former HMS Daedalus air base on which the Centre is located. A new concept military and professional RIB developed by Vectis and built by Delta Power Group has been delivered to the UK's Windermere Police. The Next-Generation RIB features an entirely clear and flat aft deck to accommodate a wide range of payloads and provide a highly flexible and capable craft for military, professional and rescue duties. When the new owner of a VT Halmatic Arctic 28 RIB wanted an enclosed wheelhouse designed and installed he approached Vectis for the job. Vectis has first hand experience of the Arctic RIBs from VT Halmatic and from providing technical support to the MOD's Arctic fleet over the last few years. 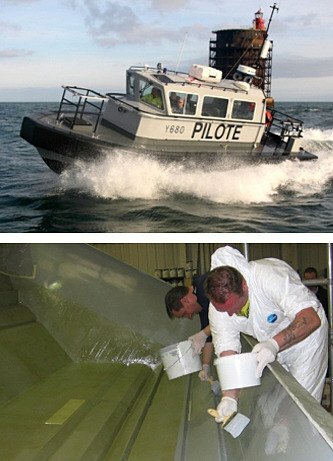 The aluminium wheelhouse was designed and supplied by Vectis as a turn-key project for the boat's new owner. Government agency projects invariably require significant project management to co-ordinate and deliver the complete project. We have built up proven project management capability to support boat builders to deliver boats and supporting elements to demanding and complex requirements. As project manager we provide the interface between the customer and the boat builder ensuring the interests of the boat builder are protected whilst maintaining delivery to programme, quality and budget. For some projects we are asked to oversee the boat build and act as the Owner's Representative and ensure that the contractual requirements are complied with. The craft may or may not be one that we have designed, but in either case we apply our knowledge and experience to work with the boat builder to achieve an efficient project that fully meets the requirements and ensure that our client's interests are met.